RPI2.0 this week announced the third round of its Seasonal US Hurricane Landfall Forecasting competition, citing the potential predictive skill of ‘crowd-intelligence’, with the winning forecast in each of the four rounds receiving a $1250 award. 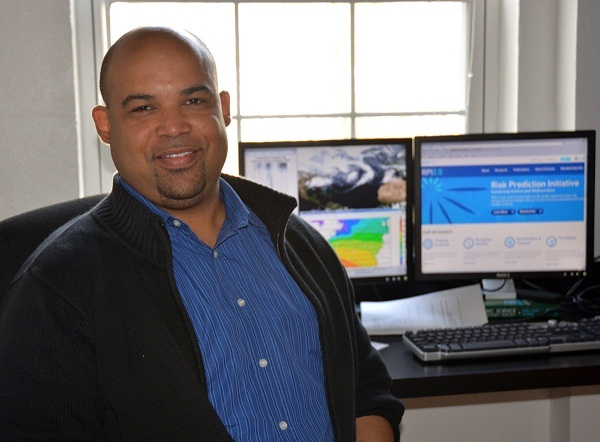 Dr. Mark Guishard [pictured] Science Program Manager at the Risk Prediction Initiative [RPI2.0] said, “For several years, I have mentioned individual seasonal Atlantic hurricane forecasts in an effort to highlight individual preparedness and emergency management for Bermuda. “Each individual forecast may only have limited skill, but the value of an ensemble suite of seasonal predictions has yet to be harnessed for predicting landfall in specific regions. Forecasts of the probability of landfall are invited for each of six regions of the US coastline. At the end of the Atlantic hurricane season, RPI2.0 will score all forecast submissions and provide an overview of all forecasts [the crowd forecast], offering a valuable source of information for individuals and organizations interested in next season’s hurricane landfalls. The Seasonal Forecast Competition has four annual rounds, with the winning forecast in each round receiving a $1250 award. While there are four annual rounds, it is not obligatory to enter all of them, and you can start entering at any point in the competition cycle throughout the year, with deadlines in December, March, May and September. The deadline to submit a forecast for this round is May 1, 2013. To take part in the forecast competition and for further information on forecast regions, lead times, and how the forecasts will be judged, please visit here. An overview of the last 2 rounds of the seasonal forecast competition can be also viewed. One obvious result is that the early forecasts tend not to stray too far from historical averages. Another interesting result is that the statistical models [vs. other model types] predict lower than climatological probabilities for landfall in the Northeast US. RPI2.0, part of the Bermuda Institute of Ocean Sciences [BIOS], funds academic research relevant to the re/insurance industry and assists in translating this research into usable and actionable results for its member companies.